October is National Bullying Prevention Month in the US, and chances are you know someone who’s been bullied — or you’ve been bullied yourself. Here, I’ve curated a list of TED and TEDx Talks that I feel unpack different aspects of the problems, solutions and experiences we’re facing in our modern world of bullying — both on and offline. I hope you’ll not only watch these talks, but also consider ways you might help to move the conversation on these issues forward. As you do, be an upstander: Show support to a target of bullying behavior or online harassment; report a bullying situation; or intervene on behalf of someone if it feels safe for you. Together, we can hopefully make it harder for bullies to thrive. Shane Koyczan’s spoken-word poem speaks to young people suffering from bullying in such a profoundly moving, empathic way that lifts the spirit and validates our humanity. He says, “If you can’t see anything beautiful about yourself, get a better mirror, look a little closer.” Watch an animated version of this talk. Rather than a search for meaning in the adversity in our lives, we need to forge meaning and build identity. “Forging meaning is about changing yourself,” says Andrew Solomon. “Building identity is about changing the world.” And in a sentence that speaks especially to me, he says, “When we’re ashamed, we can’t tell our stories, and stories are the foundation of identity.” Watch the talk. Sometimes it’s not enough to try to help. Sometimes you need to be so creative, so savvy, so plain smart that you realize to reach today’s young people you need to use their megaphone – texting. Nancy Lublin had that vision. She says of her Crisis Text Line, “If you text us, ‘I want to die,’ or ‘I want to kill myself,’ the algorithm reads that, you’re code orange, and you become number one in the queue. So we can handle severity, not chronological.” Watch the talk. Jon Ronson paints such a vivid, unforgettable portrait of how a human being’s entire existence can be brutally and cruelly destroyed in an instant by an Internet mob. He uses humor and intelligence to call us out on our public shaming — and it works. Watch the talk. Courageous actress Ashley Judd stands on the TED stage and repeats the filthy, vile slurs flung at her by anonymous hordes on Twitter. The audience is silent – shocked and disheartened. There is an important difference, she says, between free speech and hate speech. And our legislators need to write and pass laws that reflect that. Watch the talk. Safwat Saleem grew up embarrassed about his accent and his stuttering. With great insights and an infectious sense of humor, he deconstructs what it means to be different from the norm and how he challenges the “preexisting notion of normal with my work and with my voice.” Watch the talk. 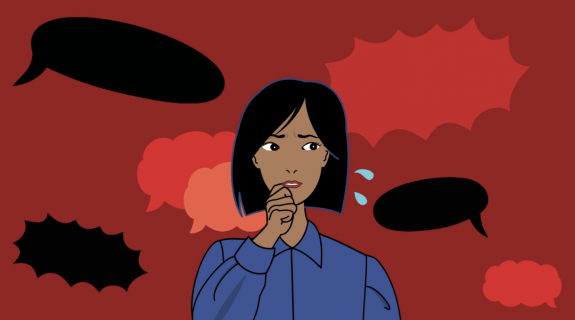 Teenager Trisha Prabhu argues that it’s time to challenge people engaging in bullying behavior and find a way to make them stop. She applied science and tech to the problem and created a tool called Rethink, an automatic message that appears before an offensive post is sent and asks the sender if they really want to hurt or humiliate the recipient. (A startling 93.4% backed down.) Watch the talk. Nine-year-old Charlie wore glasses, struggled with school and had no friends. Then he came up with an ingenious idea: the Buddy Bench. Other children could approach any child sitting alone on the buddy bench and invite him to play, or go for a walk or share a laugh. Charlie Cooper will steal your heart. Watch the talk. Tina’s thirteen-year-old daughter, Megan, was the victim of a cruel cyberbullying hoax — and tragically, she committed suicide. Tina thinks about Megan every moment of every day. And while nothing will bring her daughter back, she hopes that she can help other parents. “Put down your cell phones,” she says. “Really listen.” Watch the talk. I originally had a quote from this great talk in my own TED Talk but, sadly, had to cut for time. Understanding how our clicking behavior contributes to a culture of humiliation that feeds bullying is key. As Sally Kohn explains, “Everything we blog, everything we Tweet, and everything we click is a public act of making media. We are the new editors.” Watch the talk. Megan Phelps-Roper shares a personal and powerful story of what can happen when we open ourselves to listening to ideological viewpoints different from our own. Watch the talk. Brené Brown has arguably done more to open the dialogue around shame than any other thinker today — and she does it brilliantly. In this TED Talk, she argues that vulnerability is not weakness. Brené’s talks have personally helped me immensely. Watch the talk. Thandie Newton speaks eloquently to anyone who has ever felt like “The Other.” She draws a vivid picture of how being different shaped her sense of identity. And she describes the path she took to accepting her otherness and ultimately blossoming. Watch the talk. This article was adapted for TED-Ed from this TED Blog post. Next, read 6 effective ways to stop bullying and teach kindness to kids.